A replay on breakfast TV this morning of the well known Panarama hoax (1st April 1957) reminded me of the mission we’re on at Bristol to “turn spaghetti into lasagne”. This mission is number 7 on the JISC 10 pointer list for improving organisational efficiency: spaghetti refers to the proliferation of point-to-point (tightly coupled) integrations between our University’s many IT Systems and lasagne refers to the nicely layered systems and data architecture we’d like to achieve (see elsewhere in this blog). However, transforming our data architecture overnight is not achievable, instead we’ve developed a roadmap spanning several years in which reform of our data architecture fits into the wider contexts of both Master Data Management and Service Oriented Architecture. In November last year our senior project approval group (now known as the Systems and Process Investment Board) agreed to resource a one year Master Data Integration Project. We will return to the same board early in 2015 with a follow on business case, but this year’s project is concerned with delivering the following foundation work. 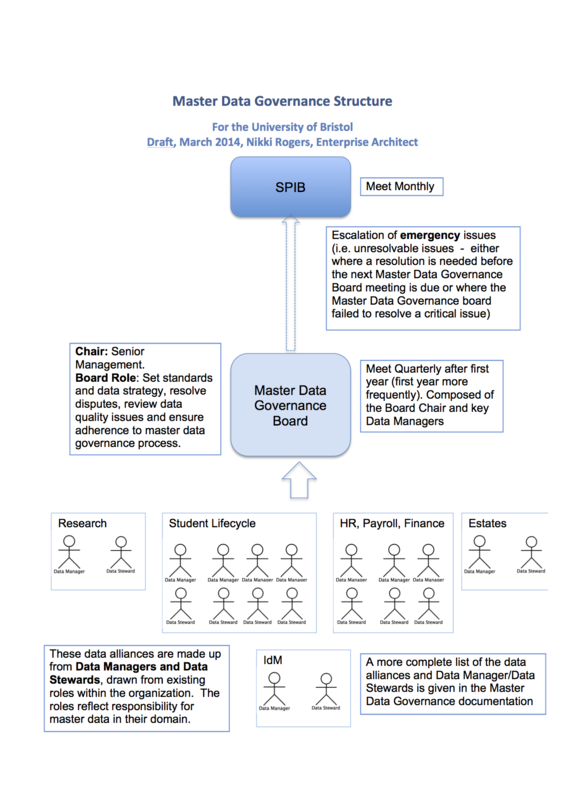 Development of a SOA blueprint for the University, including our target data architecture. 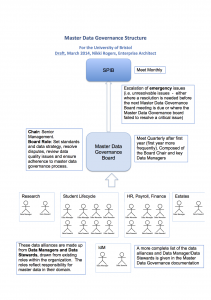 This with the help of a SOA consultant and to inform the follow on business case for SOA at Bristol, which we hope the University will fund from 2015. We are undertaking this work with the following resources: Enterprise Architect (me) at 0.3FTE for a year, a Business Analyst (trained in Enterprise and Solutions Architecture) at 0.5FTE, a Project Manager at 0.3FTE, IT development time (both for developing the Enterprise Data Dictionary and for helping to populate the Interface Catalogue with information) and approximately £60K of consultancy. We had some very useful consultancy earlier this year from Intelligent Business Strategies: several insightful conversations with MD, Mike Ferguson, and a week with Henrik Soerensen. From this we were able to draw up a Master Data Governance structure tailored to our organisation, which we are now trialling. This work also helped us to consider key issues around governance processes and how to capture key information – such as including business rules around data – in the online data dictionary. Later this year we will be working for an extended period with an independent SOA consultant based in the South West, Ben Wilcock of SOA growers. We have already worked with Ben in small amounts this year and I am very much looking forward to collaborating with him further to develop our target data architecture (most likely a set of master data services, supporting basic CRUD operations) within the context of a SOA blueprint for our enterprise architecture. 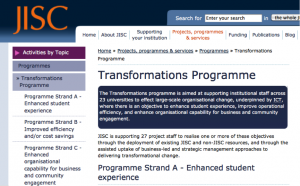 We’re very pleased to have been awarded a project under the JISC Transformations Programme. During the project we plan to use JISC resources such as the ICT Strategic Toolkit along with the support of the JISC Transformations programme and continued development of our institutional Enterprise Architecture approach to tackle the problem of achieving full integration of our various learning, teaching and research systems. We are in the process of documenting our core “master” data model and mapping the interrelationship of the data models implemented in our wide-ranging systems. This is because we need to consider how we may improve the sustainability of data exchange between systems without an on-going reliance on multiple point-to-point systems integrations – integrations that are resource-intensive and complex to maintain. By core data model I mean the data model that is core to the business of the University and that is relatively unchanging over time. We are modelling entities such as Student, Programme, Unit, Researcher, Department, Research Output etc. and the relationships between them. We are also working on the classification schemes we use such as to define the University structure for faculties, schools and departments (this is currently undergoing a standarisation process internally). Documenting this data model – and maintaining a version-contro lled history of it over time – will mean that our developers will be able to make reference to the core data model when developing new system solutions (thus avoiding potential ambiguity in the way information is shared between systems and with end-users), and we will be able to be clear about how new, external systems will need to be integrated to fit with our core data model. Finally, implementing integration support at the middleware layer will take us further on the road to ICT Maturity. 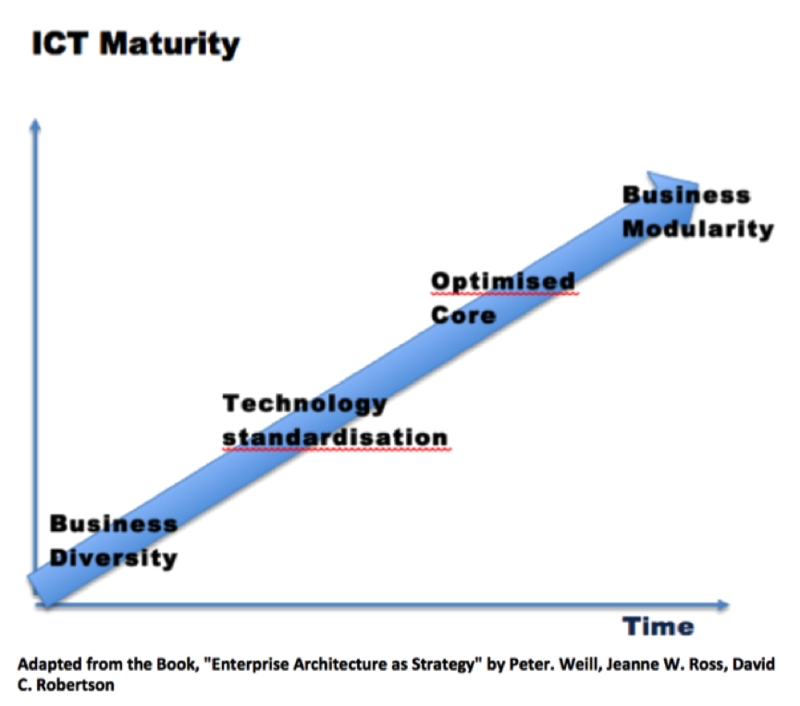 We are currently somewhere between the stages of “technology standardisation” and “optimised core” as illustrated in the diagram. Requirements are being driven by several large-scale projects at the University of Bristol including the Managing Information Project (with its emphasis on business intelligence), the Performance Enhancement Project (which seeks to provide better quality data to support our staff review and progression processes) and the University Web Project (which focuses on providing new and improved public Web content following the recent purchase of our new Content Management System). Please see the blog for the project (http://coredataintegration.isys.bris.ac.uk/about/), where more info will appear over time.